How to prevent paint drips? Easy! When doing any kind of paint project, it is important to take some precautions in order to prevent dripping and droplets. Paint dripping and drops are not esthetic, and they represent a useless waste of time. So here are some tips to help you prevent and correct those paint imperfections. If you use a spray painting gun, it is i mportant to keep a distance of approximately 30 centimeters between the tip of the gun and the surface you are painting. If you hold it too close to the wall, the paint coat obtained is thicker, which can cause dripping. Do not dilute the paint, especially if it is exterior paint. Some paints have a very complex chemical composition, and it is much better to leave the manufacturers deal with this. Be sure to apply the paint at an ideal room temperature, not when it is too cold (you need to turn on the heating during winter in Montréal), and make sure the percentage of moisture is acceptable (not too humid). Refer to the technical chart on the label to see what is the ideal temperature to apply your paint. Make sure you do not put too much paint on your paintbrush or on your roller. Pay attention to the paint surplus, and spread it evenly on the wall. Apply the same pressure evenly on the lenght of the roller, drawing vertical lines on the wall. Moreover, I recommend that you always paint in the same directoin (from left to right, for example). This will prevent from seeing a demarcation from roller strokes. If the room you want to paint is too dark, do not hesitate in installing a lamp to see the finition properly. Moreover, I recommend that you look at the surface with a 45 degree angle after painting each section: this way, you will see right away if there is dripping and you will be able to correct thos imperfections before it dires. This tip will also help you make straight lines while cutting the wall with the brush. Apply your paint in 2 thin coats instead of a thick one. this will allow the paint to dry faster, and the paint will be more evenly spread on both coats because it will dry before having time to drip. If you observe dry dripping on your surface, scrub it, sand it, and apply paint over it again. To obtain more advice on house painting, please refer to our blog section. 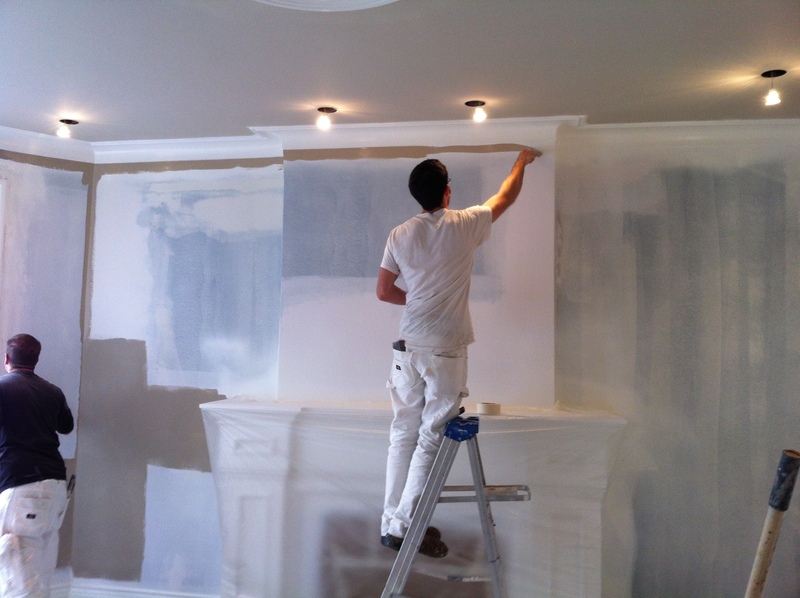 Findécor’s painters offer free quotes in Montréal. Make an estimate request now.